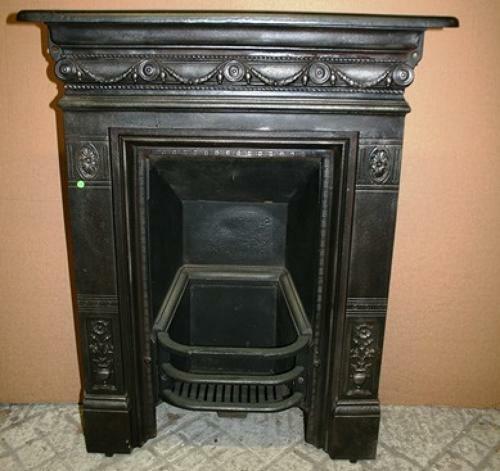 A very pretty cast iron combination fire with classic design, the fire has a lovely swag, ball and circle design and urns with flowers on the legs. The fire has rope and square borders, curved front bars and plain smoke flap and is of a petite size which would be perfect for a bedroom or small dining or living room. The iron is in reclaimed condition and has a fantastic, burnished, silver effect finish. The fire does have some signs of use, wear and some damage, with some light scratches and casting marks. There has been some damage to the mantel and it has been repaired. The crack runs along the width of the fire and the repair can be seen from the back and one side of the fire has a visible crack, please see pictures for details. There are new bolts holding the mantel and new bolts holding the concrete back. There is some damage to the iron at the back, near the concrete fireback, with a small hole. There is a small chip out of the front bars and the back has surface rust. This fire has a fantastic, classic, design that would work well with most interiors and would provide great style and character to a home.